Q: What was Glenn's mom shouting at the end of the movie? Q: Why did Glenn wash Annie's feet? This film is quite fantastic; a character study of a small town and the everyday craziness that can happen in it. From the trailer, one will understand that this will be a very deep story, culminating into some dark event that will serve as a catalyst for either growth or degeneration for those involved. Green, however, never takes the easy road to show us a conventional lead-up to said occurrence. Instead he commences our journey into the town with a lengthy portion of the comedic mundanity of life. We begin to understand these characters and their relationships with one another; we are thrust into their lives while they have all reached a crossroads of faith and find themselves on the cusp of either taking a step forward or a giant leap back. The familiarity greatly increases the emotional impact of the climatic tragedy that serves to push them all to their breaking point. It's a slow boil to utter devastation and it is handled to perfection. A lot is going on character-wise and it all is intertwined together. 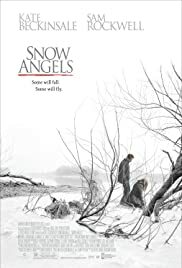 Unlike most pieces of this nature lately, Snow Angels allows each role to exist individually while also having a cursory connection to the rest. They don't walk into each other's lives in contrived ways for the sake of the script. These are real people, in close proximity, that inquire about and interact with others in their hometown much like you do in real life. A high school trombone player named Arthur is our central entry point into the tale as he touches the most people along the journey. He works at a restaurant with Annie, who was also his babysitter and an early crush many years previously (leading to a nice scene of the two reminiscing in the backroom now that they are both older), as well as her friend Barb. Glenn becomes involved through his marriage with Annie and their daughter Tara while the new girl in school Lila begins a relationship with Arthur to enter herself into the tale. Everyone's parents ask about the others in more of a polite manner than anything else. They all know each other and try to stay on top of things despite any real caring. I think at least three people ask how Annie's mother is doing, not because they want to know, but because it is what neighbors do. You have a stake in the lives of those around you because you are all involved in a community. It may be a tenuous bond, but it is a bond nonetheless; one that may connect you moreso than you might have thought. Green really allows his audience to find their own bond with the people on screen. We begin to feel for Glenn as he tries to pick the pieces of his life back up off the ground. A man chased by the demons of alcohol, he has all but lost his wife and keeps only a thin hold on his daughter after attempting to kill himself, before finding God. He is a man that means well, but might not have the capacity to endure what is happening around him as his wife is seeing someone else and still holds a small fear of him and his actions. You hope that Glenn can stay on the right path, but as you watch him continue on through everything you begin to wonder if he can. Credit Sam Rockwell with this because he is absolutely amazing. Always relegated to be the funny guy, Rockwell shows the range he had starring in Confessions of a Dangerous Mind with a devastating role. One can't praise him enough. We connect to the others as well through their strong performances. Michael Angarano is great as Arthur, growing into an adult and experiencing things that he may not be ready for. Finding his first girlfriend in Lila, (a nice turn from Olivia Thirlby), he must also confront the past; a selfish father leaving and returning what he sees fit into his wife and son's lives, (Griffin Dunne in a well portrayed bit); and the death that has gotten strong in the air. Kate Beckinsale, as Annie, shows that she can act when not wearing tight leather in vampire films, going through the biggest changes of everyone with her mother to care for, the return of her husband, an affair with Nicky Katt's Nate, and the responsibilities of being a mother. True the actors are the real shining grace here, but Green deserves praise for their work and that of the aesthetic look on display. The final act tends to drag in parts as it leads to the inevitable conclusion, but that is the only blemish from the whole. His compositions are stunning with many scenes standing out. When Dunne and Angarano are walking and talking at the father's campus, Green chooses to continue panning left even as they have stopped, not lingering on their final words but instead the void left empty in front of them as they are stalled figuratively and metaphorically in their relationship with one another. Along with instances like that, we are treated to multiple close-ups of people and objects throughout, whether it be the marching band conductor's speech or the camera that Lila takes around with her. Green has deft control on the proceedings, infusing the right amount of light humor to diffuse the darkness deep within the town. Tragedy affects everyone differently, showing some the futility of life and others the preciousness of it. It is a tough thing to lose a child, either through divorce, death, or complacency and Green puts it all on display to see whether his characters can continue on or fall forever from grace. 22 of 40 people found this review helpful. Was this review helpful to you?